Present Moment is one of the largest bulk herb and homeopathic remedy retailers in the United States & home of the Andreas Moritz Kidney Cleanse Tea. We have a vast assortment of herbal extracts & capsules, rare homeopathic remedies, internal cleansing products, essential oils & aromatherapy items, flower essences, vitamins & supplements, personal care products, and incense to warm the senses. Present Moment has been in the retail book business for over two decades and is best known for its unique and eclectic assortment of books. We have thousands of BOOKS- hundreds of which you won't find anyplace else. Please give us a call 800-378-3245, or send us an email, if you are looking for a specific, or hard to find topic. Our business is to serve you in your quest to heal your body, heal your mind. 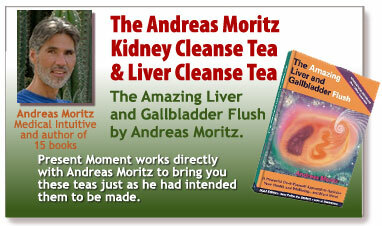 Present Moment is the honored distributor of the Andreas Moritz Kidney Cleanse Tea and Liver Cleanse Tea. These two teas help restore health to the kidneys and liver as written about in the latest book on health, The Amazing Liver and Gallbladder Flush by Andreas Moritz. Present Moment works directly with Andreas Moritz to bring you these teas just as he had intended them to be made. See articles by Andreas Moritz: Dangers of Dehydration Part I , Part II. Andreas Moritz, now has a YouTube channel, EnerChi TV. Go directly to a video where he mentions Present Moment. READINGS BY TAMMY are available on Wednesdays and Saturdays. An experienced reader, Tammy works with Numerology, Pagan Runes, Tarot, and Astrology. Please call 763-428-4409 to make an appointment. Walk-ins are also welcome. For more detailed information, go to her website. ANGELIC SOUL Reading and Healing - Master Healers Françoise and Nadine Dassier, of ENERGYWORKS! are available 2pm-5pm at the Chakra ‘Clinic’ here at Present Moment the 1st and 3rd Saturdays of each month OR by appointment. Learn more about these transformational healing sessions at energyworkshealers.com.